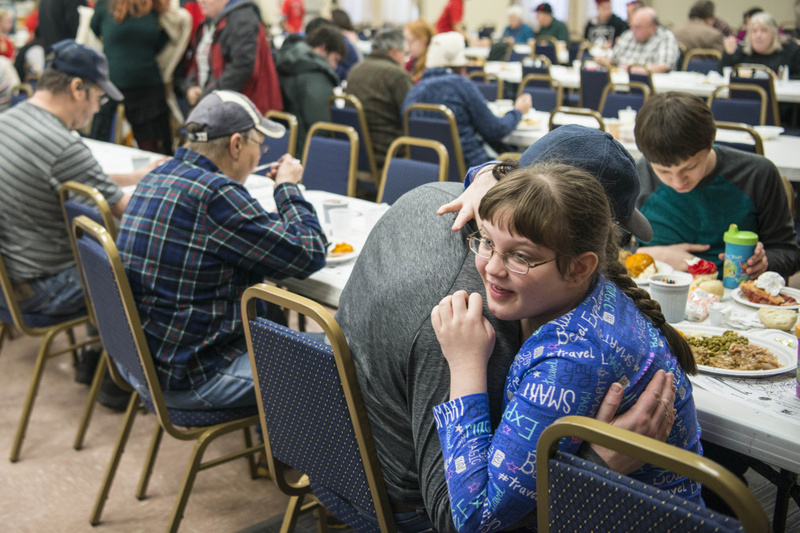 About 200 people came out Monday for the 11th annual Central Maine Family Dinner and holiday fun at the Elks Lodge. 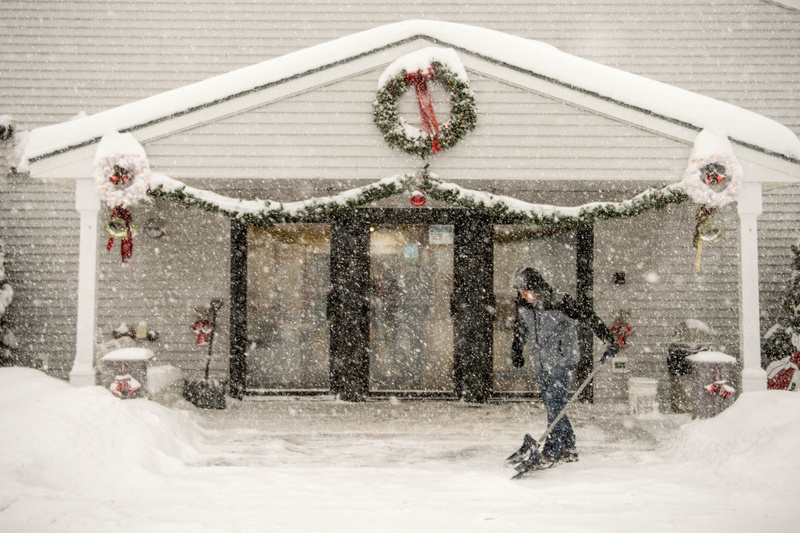 WATERVILLE — Winter Storm Ethan kept many away from the typically packed Central Maine Family Christmas Dinner on Monday at the Elks Lodge in Waterville. Cucci pointed to the inches of snow and whiteout conditions to explain the low turnout at the meal, which in previous years fed up to 1,000 guests. By noon, the volunteer drivers had to halt their shuttle pickup service because of treacherous road conditions and were only taking guests back to their homes. 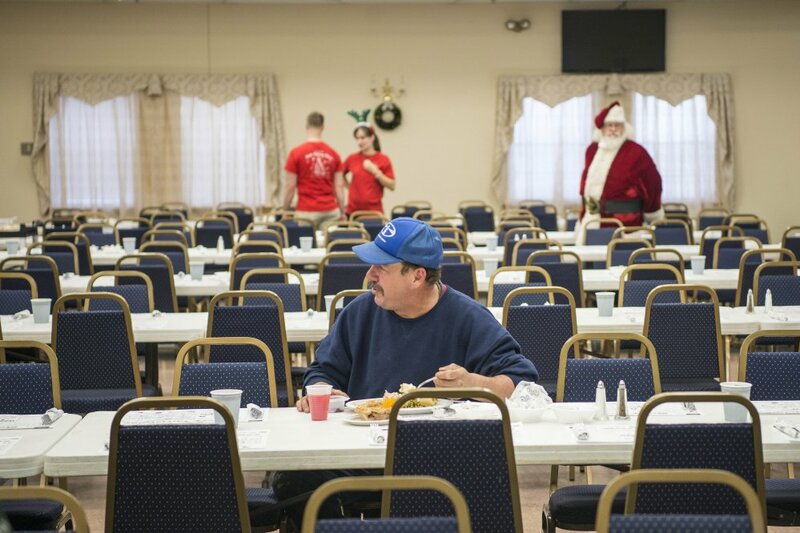 The roughly 200 diners who braved the storm and made it to the Elks Lodge did not let the harsh weather spoil their Christmas spirit, however. James Rowe, accompanied by his wife, Marcy, and their children, Thomas, 14, and Madison, 13, said they weren’t going to let the storm keep them from the meal, which ran from 11 a.m. to 2 p.m. He said they made sure to travel slowly on the roads. Marcy Rowe said it was the family’s second year of coming to the dinner and that it was a good place to be when they don’t have family functions to attend. “We figured we’d come here and get a good meal around other people,” she said. 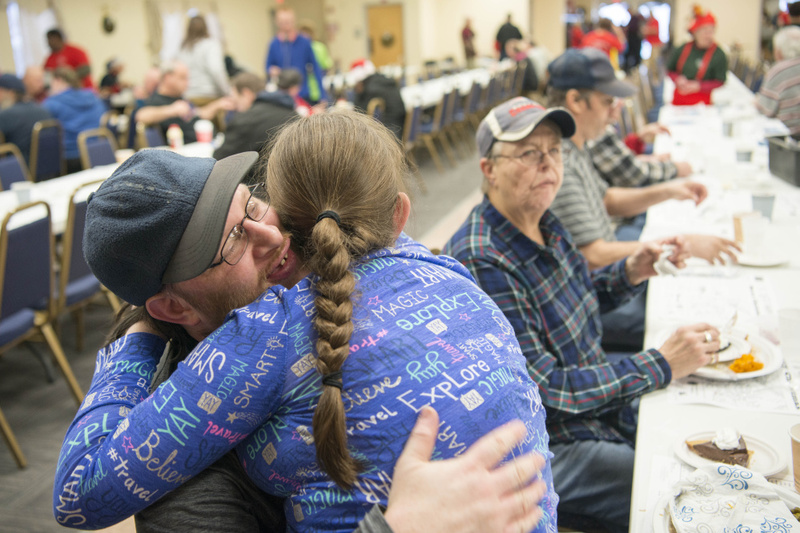 Volunteers — many clad in green and red shirts, with some donning Santa Claus hats or reindeer antlers — brought plates full of gravy-covered turkey, mashed potatoes, sweet potatoes, peas, stuffing and dinner rolls to the hungry diners. Some volunteers pushed around carts of homemade pies and cupcakes, while others offered glasses of eggnog, punch and coffee to the guests. Santa Claus greeted children for photographs and walked the floor wishing guests a Merry Christmas. Among the volunteers were Ralph and Heather Merrow, who have been working at the event since its inception 11 years ago. The Waterville couple, accompanied by their son, said serving at the dinner has become a special tradition for them and that helping out in the community is just part of their DNA as a family. It was also a family affair for first-time head organizer Cucci. Cucci had been volunteering with his wife at the dinner for five years until 2016, when she died of cancer. Last year’s event was dedicated to her memory, and now the Cuccis’ children and seven grandchildren all volunteer alongside Cucci. Cucci’s son helped greet guests at the door and one of his granddaughters spent the day making balloon animals for children. Cucci took over the event from Ziggy Lawrence, who founded the event and ran it for 10 years.